This option currently causes an IMMEDIATE crash. Turn it off and use the Connector. Please be aware that this software is supplied as is for the Flight Simulation community to use freely, If you find any bugs please let me know at rob@robgraham.info and I will attempt to get them fixed as I can. 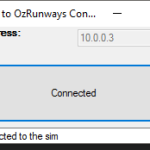 To use the application simply unzip the version you want to use load up your sim and hit connect, it should broadcast and show up in OZRunways. If for some reason your firewall etc does not allow Broadcast packets you can switch to the ‘older’ method of inputting an IP. The FSX version should work with P3D as well so long as you have the FSX Simconnect installed. OzRunways and Oz RWY are trademarks and copyright’s of OzRunways Pty Ltd. and are used with permission. Please note that the new version 1.0.8 is an installer and will add a short cut to your start menu. Same fixes as version 1.5 for P3Dv3. Unzip and Run, make certain firewall does not block. Fixed Crash on close of P3D. Fixed being unable to connect again if a connection dropped. Last version that will support older packet style. Please use the BROADCAST mode over the older packet mode. Q. I get a .net JIT error with can not load microsoft.flightsimulator.simconnect or something simular what gives? A. 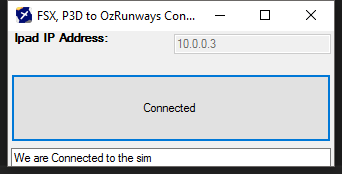 You NEED to make certain you have simconnect installed correctly, if your running FSX your simconnect files should be in your disc, Steam should be in the redis folder where FSX is installed.. as should they be in P3D.. also the zips here have a simconnect.dll with them you need that with the file. If you can’t find the Microsoft one you can dl it here:https://dl.dropboxusercontent.com/…/simconnectfsx-sp2-xpack… run the msi and it will install. P3D Should be running off LM’s Simconnect if it is not please let Rob know Rob@Robgraham.info so he can investigate. A. Check your router supports broadcast packeting. Failing that you can fall back to the ‘older’ mode and input your IPAD’s IP… though this is not recommended. A. This doens’t support Android as far as I am aware (I dont’ believe Rwy on Android supports the sim-mode/broadcast packets.. use one of the Simconnect – GPS apps to spoof the Androids GPS, just remember to turn if off if you play Pokemon Go!). Q. I get a different error..
A. Check you have .net 2.5 and 4.0 installed, failing that please email rob with the error etc @ Rob@robgraham.info he’ll try and get back to you within 2 – 4 days but due to health it may take longer.